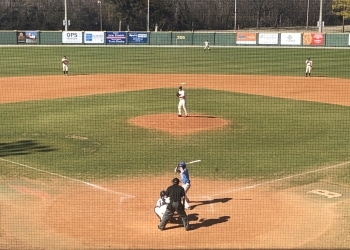 After a rare two-game losing streak Oklahoma Wesleyan baseball has found a groove again thanks to an offensive explosion. The Eagles knocked off No. 5 Oklahoma City 15-4 on Tuesday afternoon. OKWU also finished off a weekend series with Kansas Wesleyan with a 20-3 victory on Monday. This come on the heels of the Eagles’ first conference series loss after dropping the first two games to KWU. In Tuesday’s marquee win, Drenis Ozuna, Denny Perez and Brice Smith each drove in four runs. That trio also combined for five of the team’s six home runs on the day. Senior left-hander Jordan Hill went the full seven innings on the mound to mark complete game No. 18 in 38 games this season for the Eagles staff. The Eagles are currently 29-9 overall and 19-5 in the Kansas Collegiate Athletic Conference. OKWU still holds a one game lead over Tabor College for the top spot in the conference. The Eagles host Avila University for a three-game conference series starting on Friday.